So I’ve set up my tea tray, and all the bits. With some glue to seal some holes. and trimming the rubber feet to give the tray a bit more of a slant it works really well. 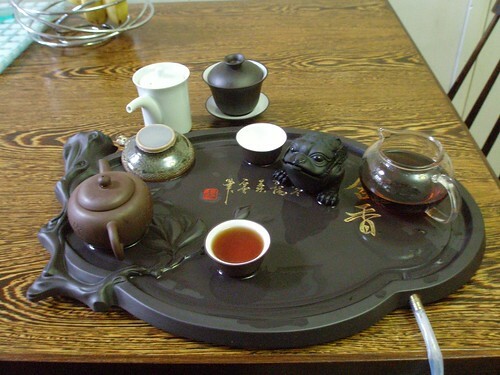 The teapot, tray and money frog are all made from Yixing Clay (I hope!). So I’ve made some of the nice Longjing (龙井茶) for Michael and some of the new Pu-erh (普洱茶). Great fun! 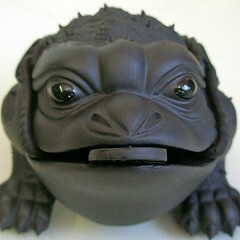 I’m also enjoying using my Ch’an Chu (Money Frog, 蟾蜍) you can read about them here. Finished the Book of Slumdog Millionaire on the way back from Beijing. Michael saw the film while I was away and thought that the book was better. I certainly enjoyed it. The structure with the quiz show timeline linking in with short stories from Ram Mohammed Thomas’ life was really engaging. I thought the ending was a bit cheesy, with a good Bollywood twang! One of the PhD students at Peking University took us out for lunch on Wednesday to one of the campus restaurants, which was fun. 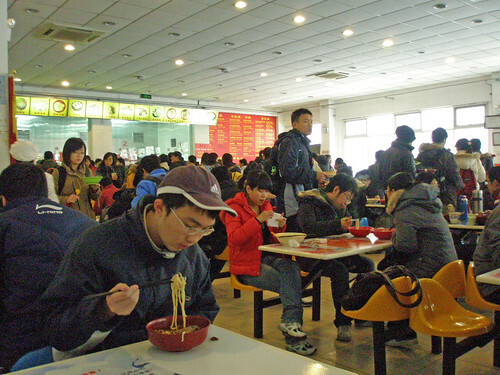 We ate a big bowl of nice noodles for about 50 pence each. 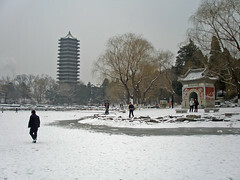 He also gave us a tour of the PKU lake, which was frozen and were were able to walk across the ice. Lots of people had been skating on the lake the previous week, but the snow meant that they weren’t skating while we were there. 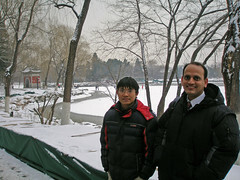 In the afternoon we went to Tsinghua University. 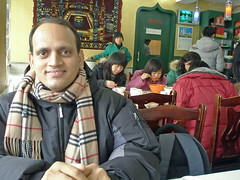 In the evening, Pardha and I went out to the Xiushui Silk Market, or Silk Street (秀水街). It’s a massive place, and fairly hard work with hawkers trying to sell you a large array of stuff. Pardha wanted to buy some silk dresses for his wife and daughter and he was an amazing barterer. The women on two of the stalls commented on how tough he was (in a respectful way!) and I think both parties had a good time. I watched! Thanks to his skills, I got 10 silk ties (rather nice) for about £10. On the way out he bought a couple of tea sets, and I was lured into buying a purple clay tea tray to complete my Yixing clay tea set that I’ve built up over various trips to China and Malaysia (I’ll write more about that later). The tray is rather large and heavy, and the price came down from £200 to £30: Pardha reckoned he could have got it for £25, so I didn’t do too badly. Now that I’ve got it home there is quite a bit of maintenance to do: leveling the tray and sealing a few holes! I think it will get there. After the Silk Market we took a small three-wheeler scooter to Tiananmen Square. The temperature was below zero, and by the time we got there we were both freezing cold and ripped off! 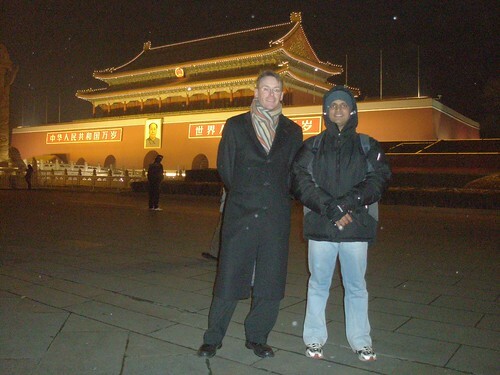 We had a quick look at the entrance to the Forbidden City, and were there to see the lights turned off at 9.30. It’s impossible to see get a taxi from that part of Tiananmen Square, and we had a fairly long walk to try and find one. Finally, I couldn’t take the cold any more and we popped into a rather grand hotel for dinner. The hotel was grand but in a dusty and cluttered faded sort of way, and the food was expensive and bad! But al least it was warm and we we heated up nicely until the hotel turned the heating off about 10.30! Luxury indeed. On Thursday we visited the Institute of Chemistry at the Chinese Academy of Sciences. We stopped for a brief lunch at a nearby restaurant, where we were the centre of the attention and the people int he kitchen all came to look at us an give us wave! Come to think of it it might have been because I was in a jacket and tie, rather than because we were foreign! 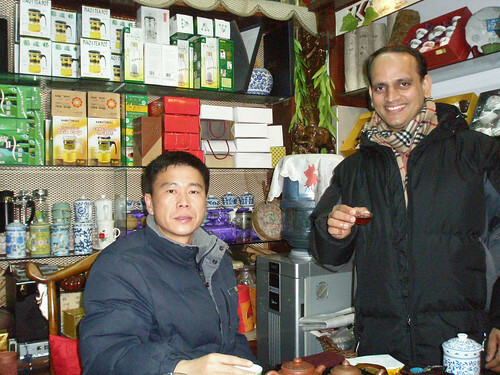 We had another visit to Peking University, then walk down the road from the hotel to a little tea shop, where we spent close to two hours tasting lovely tea with the owner and his mother. I bought some very nice Longjing (龙井茶) and a disk of Yunnan Pu-erh (普洱茶). 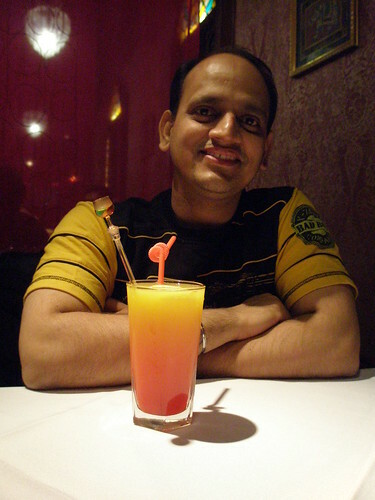 Pardha bough loads of tea: he also bought some Jasmine and another type of Green Tea. We had a great time and got a small discount from the shopkeeper. I also came away with a Money Frog, which I love, more on that later. 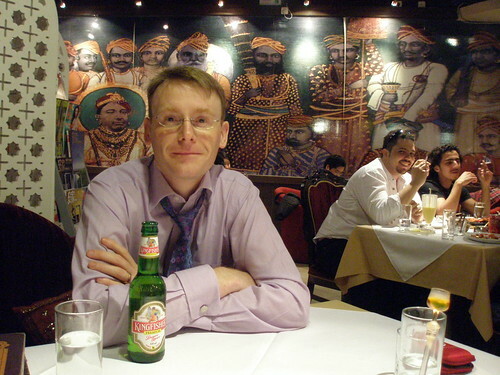 We spent a long time in the tea shop, I finished the scanning of our notes to send to India, spent a frustrating 40 minutes printing out my boarding pass in the ‘business centre’ and after all that we had to dash to a restaurant for dinner 30 mins before the place closed. I had a nice meal, but Pardha couldn’t find any vegetarian stuff he liked so had some biscuits in his room. The restaurant started turning the lights off on us about 10.30! The night I arrived in Beijing I was lucky enough to sleep for about 10 hours, right through till my alarm at 8am. I’ve not been so lucky this morning, and I’ve been up since 6am. I forgot to take melatonin last night at bed-time, so I’m wondering if that made any difference? Who knows? Beijing is freezing cold! Some snow fell yesterday and I forgot how cold the university building are: Pardha and I went out in jackets and then sat in shivering in offices – when we finally got in a taxi home we were chilled right through! We’ll be wearing warm coats and beanie hats today. This is being quite a different trip to China. It’s been really hard finding vegetarian food for Pardha, so we’ve eaten in two Korean restaurants, a western restaurant in the hotel and an Indian restaurant (which was great)! I’m still waiting for a Chinese meal! I don’t remember there being so many Korean and Japanese restaurants in Beijing when I was here last, the Korean places have great Kim Chi, and lots of veg options. 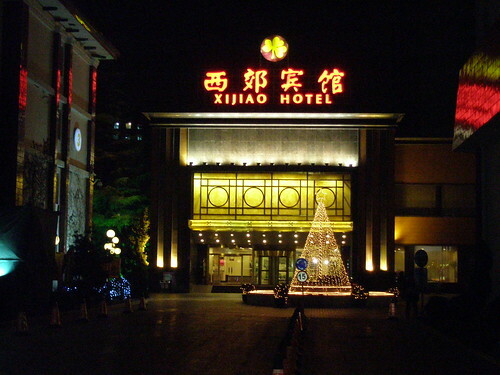 We’re staying at the Xi Jiao Hotel (北京西郊宾馆) which is close to the Universities that we’re visting. 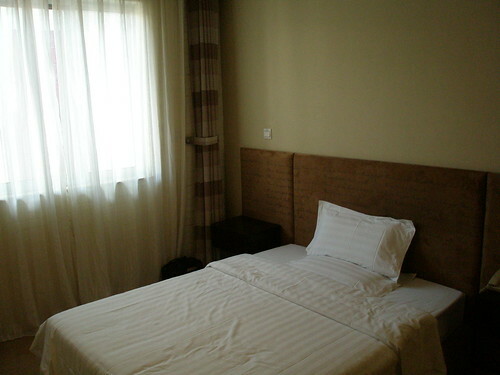 The hotel was only US$59 per night, so I was a bit hesitant about what it would be like. The rooms aren’t very glamorous, but they are very quite and warm and have free wired internet! 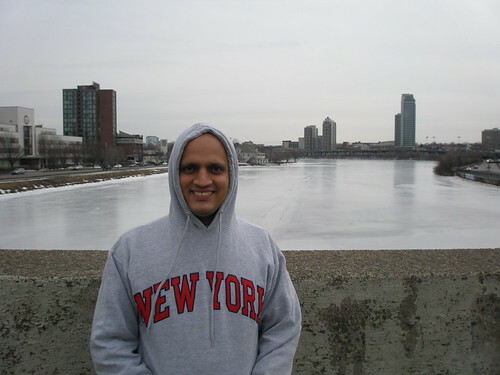 I’ve had a good trip to Boston with Pardha. We’ve done well for the work that we came here for, and eveything is falling into place nicely. We went to the Top of the Hub at the Prudential Tower where I had a wicked Hendricks Gin Martini looking out over the great view of the city at night. Also had dinner at Legal Seafoods with some Harpoon beer. Met Stephen for a “gourmet sandwich” and nice locally brewed beer in Boylston Street. It’s been really cold and windy, but clearly it’s actually milder than it has been because the river of ice has melted since we got here, and there are just a few sheets of ice left floating by. We’re flying back to London in a few hours, then have something like seven hours in Heathrow before flying on to Beijing. 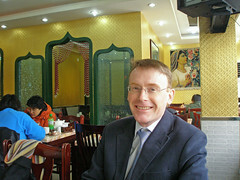 Arrive in Beiijing on Monday midday, local time. I’m not going to think too hard about that and I’ll trust on my (new) melatonin tablets to sort me out a decent sleep once I’m there: but hopefully that will be after my first meeting at 4pm! Pardha and I arrived in Boston last night after one of the quietest flights I’ve been on. There was hardly anyone on board. The films were rotten: watched half of a new Simon Pegg comedy that left me cold, and that was it for films. Great Dan Snow documentary about the emperor Hadrian. 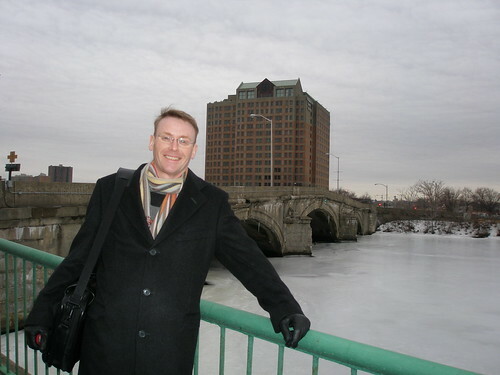 The Charles River is frozen, which is exciting. We’re staying at the Doubletree Guest Suites in Cambridge, close to the Universities. The room in the hotel are small suites, which is workeing out well as Pardha and I can work together in the front room, separate from the bedroom. The hotel is very quiet, all the floors below 12 are empty and there are 15 floors, so things must be a bit tough. Had a great lunch today at the Whole Foods Market, with a massive salad bar with probably 40 different salads, in large industrial tubs. The salads were sSold be weight in paper trays. All the salads I had were excellent (including seaweed 🙂 ) except for the vegetarian ‘chicken’ tofu in a smoky sauce, which was vile.